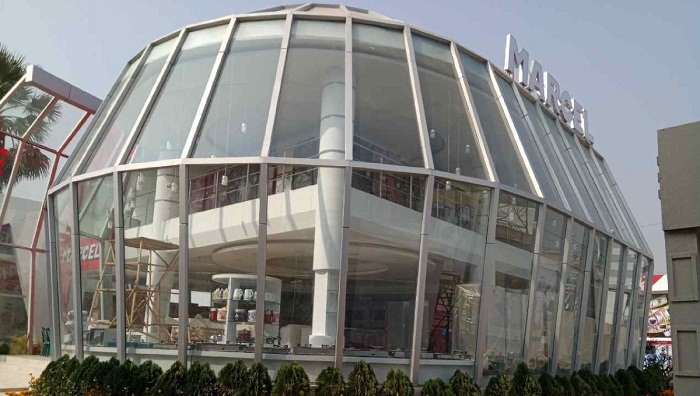 Local brand Marcel is showcasing and selling nearly 300 models of electronics, electrical, home and kitchen appliances in the ongoing Dhaka International Trade Fair (DITF). “We are showcasing a wide range of appliances in the DITF so that buyers can pick up their necessary electronics, electrical, home and kitchen appliances under one roof,” said Md Sayful Islam, in-charge of Marcel Pavilion. Marcel brought out new models of various types of appliances with lucrative designs and colours on the occasion of new year and DITF-19, he said. On the first floor of its two-storey pavilion, 72 energy saving fridges are showcased. It is also displaying seven models of energy saving air conditioners with latest technology. The pavilion was decorated with around 30 types of products like frost and non-frost refrigerators, freezers, LED and smart televisions, air conditioners, washing machine, microwave ovens, room heater, ceiling fans, wall fans, rechargeable fans, kitchen cookware and others sorts of home appliances to attract visitors and buyers. “Customers’ preference to Marcel products is sharply going up. At the DITF, visitors and buyers will show great interest in Marcel Pavilion,” hoped Dr Md Shakhawat Hossen, head of sales of Marcel.